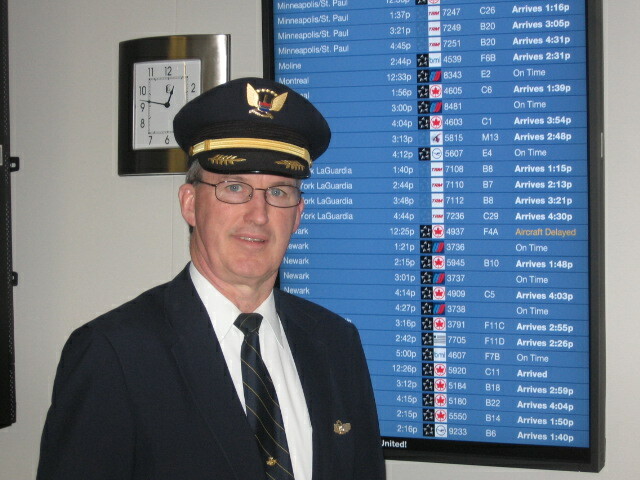 Captain Dennis J. Flanagan at Chicago O'Hare International Airport. I had heard a lot about Mr. Flanagan’s rarely attentive customer-service approach from fellow travelers, and even spoken with him on the phone with the intention of writing about him, but not having met him in person always stopped me. Now I have no more excuses. Our encounter wasn’t planned. As I boarded a plane in Phoenix, I saw a pilot greeting passengers at the door and handing out small information cards about the Boeing 757 he was about to fly. I had no idea what Mr. Flanagan looked like, but I immediately thought it might be him. A minute later, the purser confirmed my suspicion. My tendency to arrive at the gate no earlier than boarding time had made me miss Mr. Flanagan’s initial interaction with customers. He usually introduces himself in the gate area, thanks everyone for flying United and says a few words about the flight. Actually, Mr. Flanagan said he starts thinking about his passengers even before he gets to the airport by “pre-writing thank-you notes” on his business cards. After takeoff, when the plane has reached cruising altitude, he “adds the names of customers in first class, including any employees” sitting there. “Have you ever tried to get control of an arm rest once it’s occupied?” But when “a flight attendant stops at your row, leans over and says, ‘Excuse me, I have a note for you from the captain,’ your neighbors would like to know who you are and what the captain had to say. So one leans left and the other leans right, and the two armrests are yours for the taking,” Mr. Flanagan said. “My flight attendants witness the experience and later call and start telling me the fantastic story of the person in the middle seat using the arm rests. They are shocked,” he said. You can listen to Mr. Flanagan’s interaction with air traffic controllers during a flight, thanks to United’s Channel 9, a service much loved by airline junkies but which some pilots choose to turn off for various reasons. After landing in Chicago, Mr. Flanagan went back to the aircraft door to say goodbye to his passengers. On his way down the cabin, he picked up trash and looked for any items left behind on the seats to help out the cleaning crew. Meeting Mr. Flanagan a day after another United pilot was arrested in London for showing up drunk at work was a good advertisement for the embattled airline, which, like many in the industry, is struggling to improve its customer-service image. Mr. Flanagan said he tries not to get involved in management and labor controversies, but simply to do his job and leave his customers satisfied as they get off his plane. This entry was posted in Travel and tagged airlines, Boeing, captain, Chicago, Cleveland, customers, flight attendants, London, Ohio, passengers, Phoenix, pilot, Travel, trips, United Airlines. Bookmark the permalink.